Waterproof! 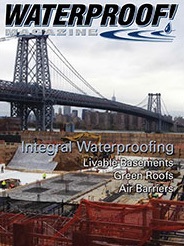 Magazine is the only magazine covering the industry of commercial and residential waterproofing. I wrote two stories for the Summer 2018 issue. The other was on finishing basements. Read this article as it appears on the Waterproof! Magazine website, or view the Air-Barriers PDF. It’s important to consider the whole of your factors when making this key decision for your building. Ask any air or vapor barrier professional what the first step is in determining the proper barrier for your building and they’ll likely say that climate zone is one of the most important. Knowing the temperatures and general climate condition the building will be exposed to is key to deciding what products to use. Kristin Routh, product marketing director with Neptune Coatings in Nevada, says examining the planned use of the building and its location is the first step. “If the building is being designed for Chicago, for instance, you’re going to need a different air and ventilation system than you would need in Arizona,” she says. “The reason behind that is to determine precisely where your dew point is going to fall within your wall cavity design,” explains Casey Chandler, commercial sales leader at Mar-Flex Waterproofing & Building Solutions in Ohio. Cold air holds less moisture than warm air, and the temperature at which the moisture condenses out of warm air as it cools is called the dew point. While new developments in technology have been made, some traditional self-adhered membranes, such as rubberized asphalt typically can only handle temperatures up to 158 degrees Fahrenheit. “It’s important to determine and communicate what the high-end temperature that the air barrier will be exposed to during construction and throughout the life of the building is, so the appropriate air barrier can be chosen,” Tyler says. The number of heating and cooling days, and purpose of the building will also affect the selection process. For example, if your building has a pool in it, you would consider a different assembly than one that is a museum,” says Tyler. In this case knowing your climate and building purpose will help in this process. It’s important that the air/vapor barrier system be considered as part of the entire wall assembly. Combining testing of the individual materials and accessories as well as testing for the wall assembly is most effective. Testing on the material level alone can provide misleading results. One of the primary goals in using an air barrier is to create air tightness. “Air leakage is one of the single biggest issues around two things—energy loss, because moving air will carry heat, and the other is durability and resiliency of the building, because moving air will also carry moisture,” explains Barrett. One material isn’t used for all situations anymore, because there are so many different types and configurations of assemblies and sheathing. A permeable system is considered by most to be a little more forgiving in the sense that they will work in most climates. “The permeable systems end up allowing buildings to breathe while still keeping moisture out, and they’re also a little more forgiving when it comes to the different wall assemblies,” says Chandler. Kevin Polk, president at Epro in Wichita, Kansas, says an increasing number of clients are asking for their permeable air and vapor barrier that is made from recycled products. Epro’s EcoFlex PS air barrier contains almost 40% post-consumer recycled content. Building owners choose this permeable system to help meet LEED goals. When considering price, you have to consider the price of the product as well as the price of installation. Spray-applied membrane systems reduce labor costs because the spray goes right over seams. Fluid applied membranes tend to be a more expensive material, but they tend to be easier to apply. Sheet membranes are a more cost effective material, but hanging them is kind of like hanging wallpaper, and is more labor intensive. Improved technology has allowed manufacturers to make much thinner membranes, but that doesn’t necessarily translate to reduced costs. Some sheathing manufacturers are now beginning to produce sheathing with air barriers already applied. While that may reduce labor costs, because a crew doesn’t have to apply the sheathing, these are more expensive than other products. According to Chandler, a standard bituminous air barrier costs about $2 per square foot, a synthetic, such as spun-bonded polypropylene membranes, costs about $1.50 to $2 per square foot and the pre-applied sheeting costs $4 to $6 per square foot. These cost figures will vary depending on product, project size and market. The goal of any air barrier system is to be continuous around the whole structure, including details such as window wells and corners, roof joints and flat areas of the building. Detailing is particularly important when the barrier system interacts with another material, such as with the foundation or roof system. “Whoever your air barrier supplier is, you also want a full system of accessories that’s going to make it relatively easy to make that structure airtight,” explains Barrett. Barrett says window corners tend to be one of the most common weak points in a barrier installation. Another common failure area is where material overlaps, if it doesn’t stick well to itself. A self-adhering edge on a membrane that sticks to itself takes that risk off the table. Investigate the system you choose to make sure that the quality control is in place, and that the system works with details such as window wells and any other architectural elements your building may have, to ensure a complete seal. Barrett says another way that holes can be created in your building envelope is if, for instance, the plumber comes along and punches a hole in the barrier for a pipe and no one goes back to fix it. “A good way to cope with that is getting inspections,” Barrett says. He recommends specifying a good quality assurance program that incorporates inspection, such as the one available through the Air Barrier Association of America.